Football in Koper started in 1920 when the western part of Slovenia was then under Italian rule. The original club was formed by port workers and fishermen and was called Circolo Sportivo Capodistriano. The new club played on a sand pitch near the sea which was regularly flooded. The clubs early opponents were Italian clubs like Trieste, Vicenza and Mestre. Under the fascist Italian regime of the 1930’s the club changed its name to Unione Sportiva Capodistriana and then Unione Liberi Calciatori. 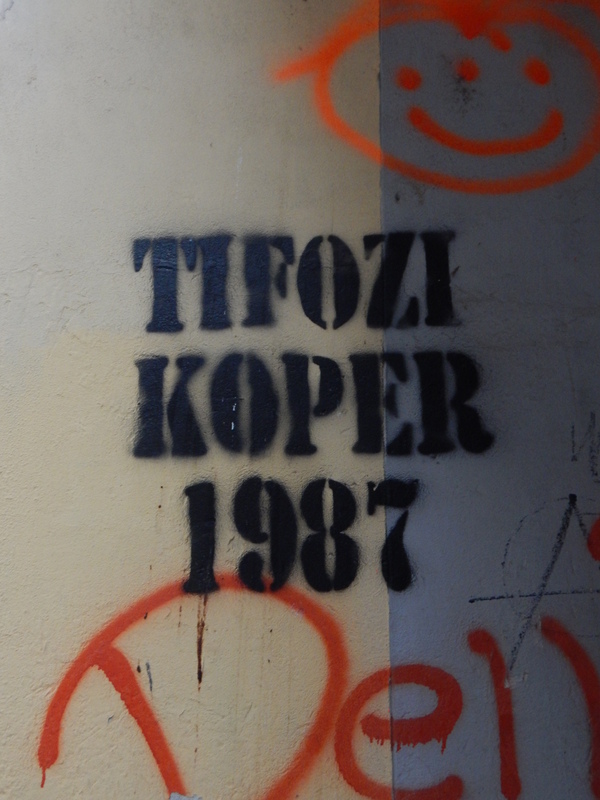 During the war there was heavy damage to the town of Koper and only five clubs in the area re-emerged when football restarted. These clubs were NK Izola (who had played in the Italian professional leagues), Colaussi, Unione Ragazzi Juventini, Combi and Virtus. The present day club, NK Koper, dates from 1955 and came about as a merger of two town clubs called Aurora Koper and Koper Medusa. 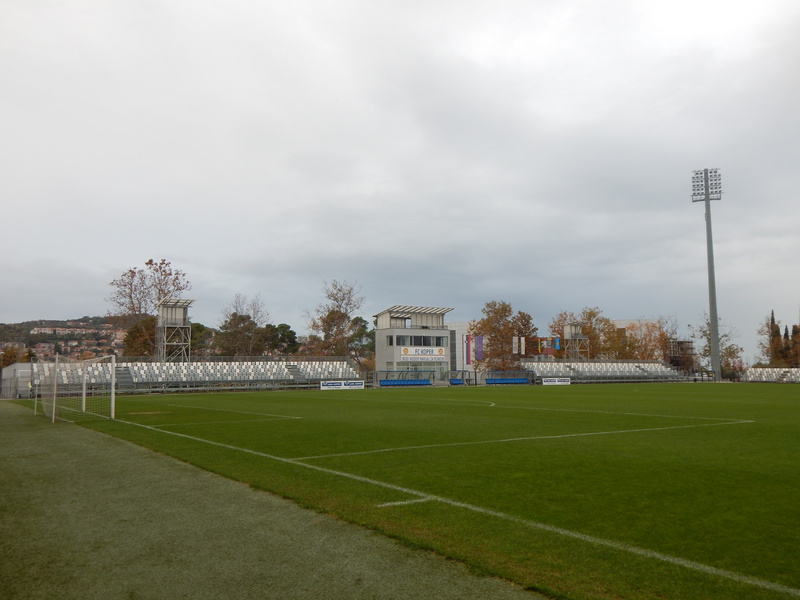 In the mid 1990’s the club suffered severe financial problems and had to fold, re-emerging as FC Koper. Further problems were encountered in the mid 2000’s when then owner Georg Suban decamped to Prva Liga rivals NK Mura taking most of the Koper team with him. Since then the club has been fan owned and owes a debt of gratitude to the Serbian/American businessman Milan Mandarić who wrote off the club’s entire debt just so they could carry on playing. 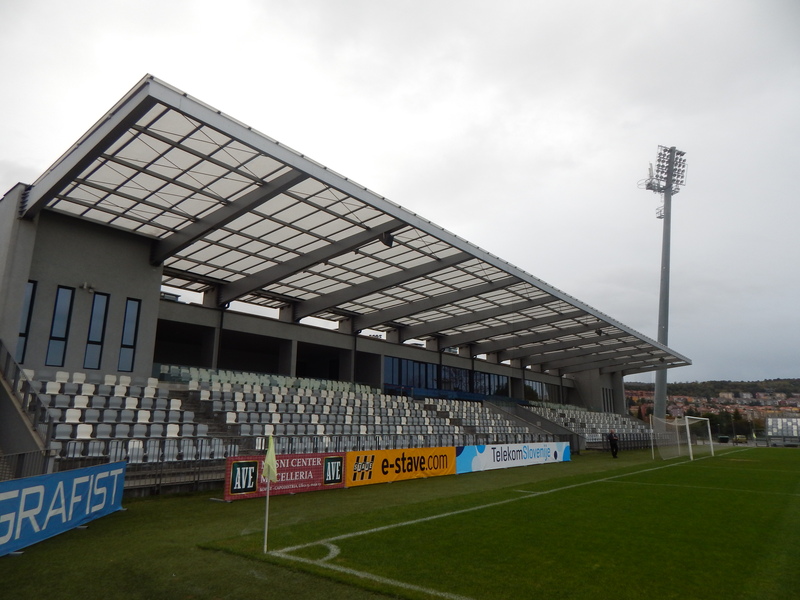 NK Koper moved to their current stadium in 1962 (although it had been built in 1947) and this was renovated in 1996. 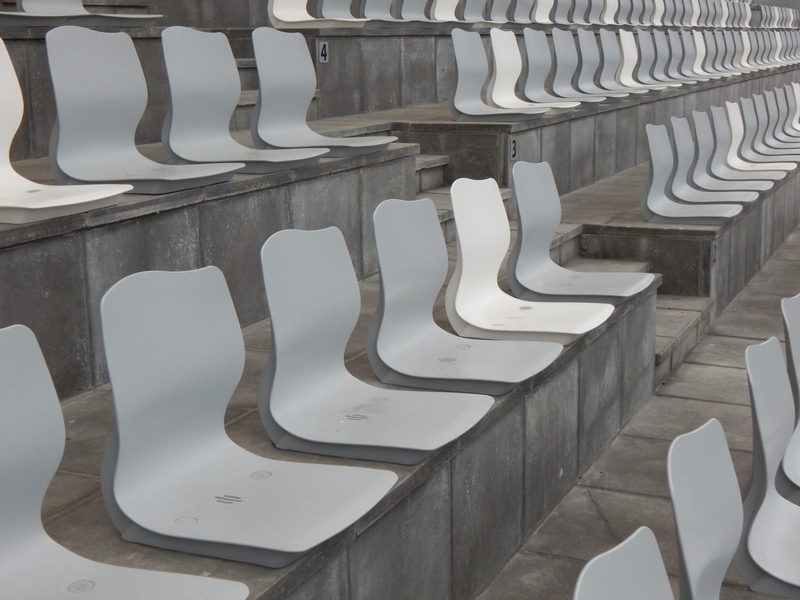 Prior to this the all time record crowd at the Bonifika was 10,000 who gathered for a match against NK Olimpija Ljubljana in 1987. 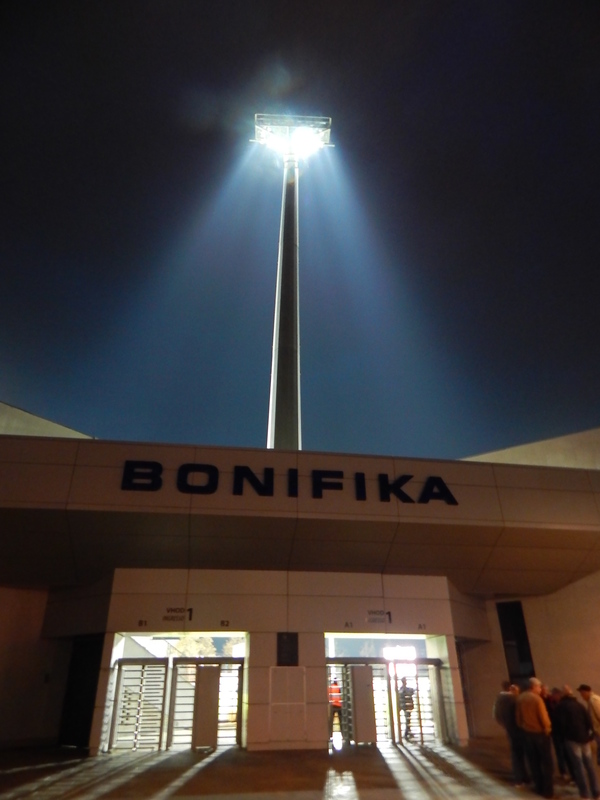 However the Bonifika was completely rebuilt and modernised in 2010, re-opening in October of that year, and now boasts a more than suitable 4,047 seats on all four sides of the ground. 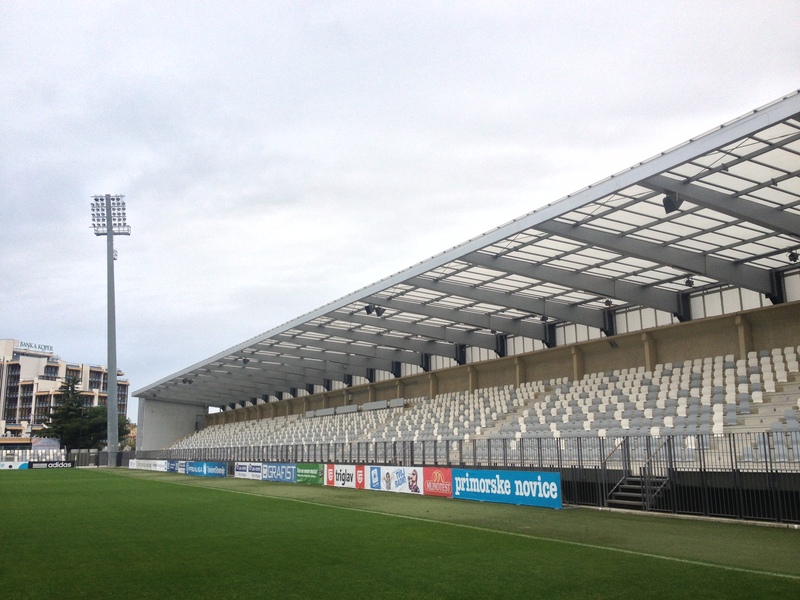 The rebuild coincided with Koper winning the Slovenian Prva Liga for the first time and qualification for the Champions League. The team have also been runners up twice in the competition which has run since the 1991 independence from Yugoslavia. 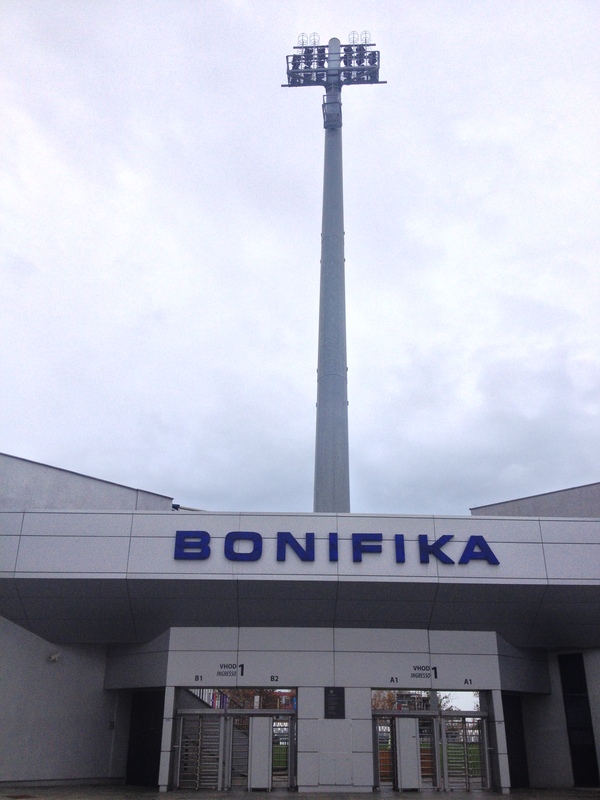 The club changed its name to FC Anet Koper in 2003 and five years later changed it again to FC Luka Koper, Luka being Slovene for port, to identify more closely with its maritime heritage. Despite being runners up to Maribor in the Prva Liga last season the Kanarčki (The Canaries) have struggled somewhat this season and go into tonight’s match lying in sixth place in the table of ten clubs. Koper’s guests from Rudar Velenje are a place below them in seventh. 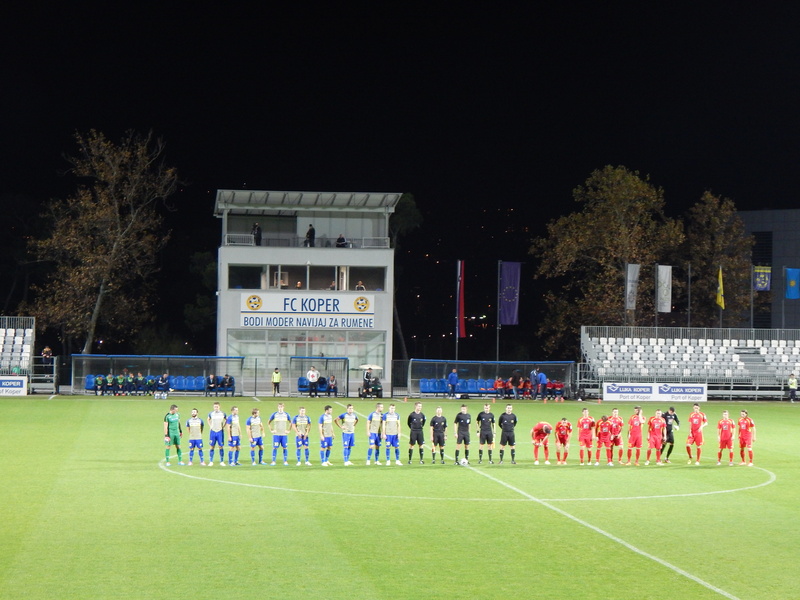 The hosts started brightly and playmaker Mitja Lotrič was the architect of several chances for Koper with some clinical passing. When it came to finishing the excellent approach play the home team were somewhat lacking, and at the break only had a Damir Hadžić header, unmarked at the far post, to show for their efforts. 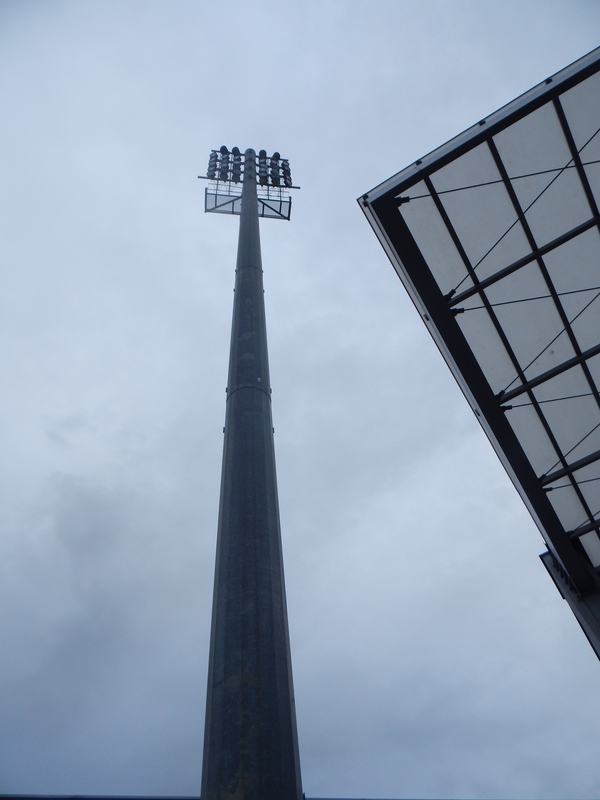 The visitors from Velenje restored parity soon after and the break through Kleman Bolha. 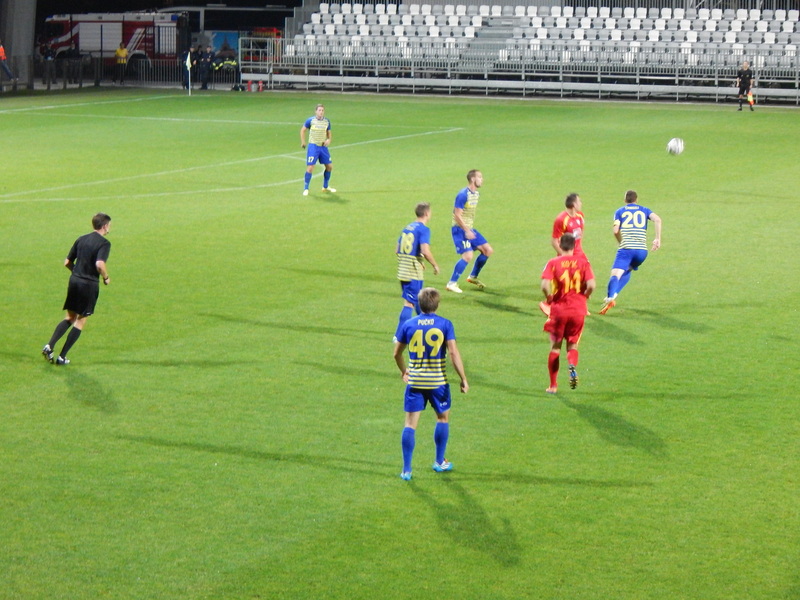 The key moment of the match arrived on the 65th minute when goalscorer Hadžić lunged in somewhat on Rudar’s Denis Klinar and was shown a second yellow card followed by a red. After that point, and the inexplicable substitution of Lotrič, the home side struggled for possession and the visitors rattled in two more goals to seal their first win in Koper for five years. Koper aside from the working port has a lovely old town and is well worth a visit to soak up some sun and some its convoluted history. 1. Ermin Hasić, 3. Miha Gregorič, 4. Denis Šme, 10. Mitja Lotrič, 16. Denis Halilović, 18. Leo Štulac, 20. Domen Črnigoj, 21. Nenad Srečković, 27. Damir Hadžić, 30. Jaka Štromajer, 49. Matej Pučko. Subs: 2. Aleks Petrovčić, 5. Miha Blažić, 6. Nik Mršič, 7. Ivica Guberac (for 30, 81 mins), 8. Urban Žibert (for 10, 72 mins), 12. Primož Bužan, 19. David Vidaković. 12. Matjaž Rozman, 5. Nemanja Stjepanović, 7. Ivan Firer, 8. Aljaž Krefl, 9. Damjan Trifković, 14. Milan Kocić, 23. Denis Klinar, 25. Kleman Bolha, 26. Elvedin Džinić, 29. Ivan Knezović, 33. Mario Babić. Subs: 6. Uroš Rošer (for 33, 76 mins), 11. Nejc Plesec, 13. Matej Radan, 21. Nikola Tolimir, 24. Enis Saramati, 27. Rusmin Dedić (for 23, 69 mins), 28. Dalibor Radujko (for 29, 60 mins).